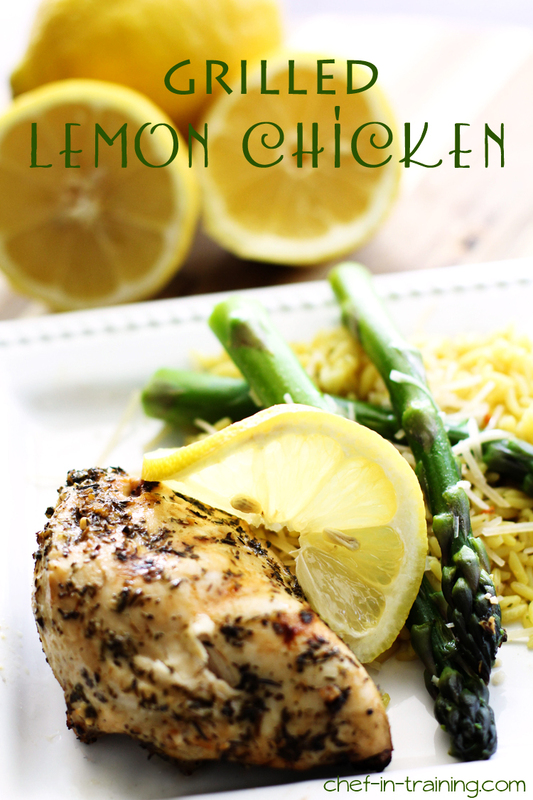 This Grilled Lemon Herb Chicken is unbelievably good! The marinade is absolutely amazing and the chicken is beyond flavorful and juicy! I love summertime! One reason in particular, is that we use our grill a lot more than normal. Grilling is one of my personal favorite ways to cook food. The recipe I am sharing with you today is nothing short of amazing. The PERFECT summer dinner! So fresh and delicious! Gently squeeze lemons into a large ziplock bag, leaving lemon wedges in the bag. Add minced garlic cloves, fresh thyme, cayenne pepper, vegetable oil, fresh minced basil and salt to ziplock bag then zip to seal bag & shake. Add chicken to ziplock bag & turn to coat. Seal bag & fridge for 24 hrs. (or overnight) turning frequently. Remove chicken and grill over medium heat until juices run clear. Mmm, I love these simple flavors and anything that is grilled am very excited about! This looks awesome! Adding lemon to chicken I think is one of the best things to do! It really takes on the flavor in such a good way! Looks perfect for summer and our new grill! Yum! You are right, I want to make this asap!! Bonus, it is mega healthy!! This looks delicious. I'm definitely adding it to my summer recipe list. This is a perfect summer meal! Love the simple flavors and can't wait to grill this chicken up. Totally agree! One of my favourite things about summer is grilling and just eating outside in the fresh air. The cayenne pepper has to be the secret ingredient with this chicken... I know my family would love this one! This sounds awesome. I love collecting grilling recipes since we grill year round here. This one sounds amazing. Made this last week - it was really great! Thank you!! Hi. I'm a beginner in the kitchen & I was wondering how to make this recipe for two people only (It's just my husband & I) This recipe looks amazing! I'm looking forward to trying it out soon. Thank you in advance for your response :). Basically it just common math. For Instance this recipe calls for 3lbs. Say you and you husband will eat a pound of chicken. Which is 1/3 of what the recipe calls for. So you would divide all the ingredients on the list by 3 to get the proper amount of ingredients needed. :) enjoy! Also when you go grocery shopping you can just make it simple by making the sauce and freezing it in portions suitable to you and your husband.